redeem (verb) – to do something that makes other people have a better opinion of (you), especially after you have behaved badly or failed at something. — Cambridge Dictionary of American English. Whoever first coined the phrase, “The road to redemption” must have understood that redemption is almost never a single act or gesture. Redemption is a road that, like all roads, must to be traveled a step at a time. Today USA took another step towards redemption with its 31 point defeat of Australia. There are 3 steps left to go. The story line to this game is an interesting one. USA led by just 1 point at then end of the first quarter, and would have taken just a 6 point lead into the locker room at the half, were it not for a missed 3 pointer by Australia’s Mark Worthington, a rebound by Chris Bosh, then a buzzer beating 3 pointer by Deron Williams. That buzzer beater is more remarkable when you realize that Williams was only 1 of 5 from the arc against Australia, the buzzer beater was his only successful 3 pointer. After a close first half, Kobe Bryant took control for USA by scoring 9 of USA’s 14 to 0 run. After that, USA slowly built on its advantage. Australia probably thought it was playing well against USA in the first quarter, but I didn’t see it that way. For some reason every American but Jason Kidd started off the game completely infatuated with dribbling. I was really frustrated. The ball movement was so stagnant, that USA did not have an assist the entire first quarter. In fact, with 2:51 left in the third quarter, Mike Breen and Doug Collins mentioned that USA had only 1 assist the entire first half. USA moved the ball considerably better after the break though, and had 15 assists in the second half. Also, defensively this was the worst game of the 2008 Olympics for Team USA. Never in these Olympics has USA allowed an opponent to score so many points. Opponents have been averaging 70.8 points per game, USA but allowed Australia to score 85. Why isn’t anyone talking about USA allowing 85 points?! That is enough to have won 12 of the games played so far in these 2008 Olympics! Opponents had been averaging just 36.7% from the field but Australia shot 43%, easily the highest shooting percentage allowed by USA. And Australia was actually -2 in turnovers, and +2 on points off of turnovers! The closing play of the first quarter was typical of USA’s defense: after a MADE free throw by Chris Bosh, Australia put the ball in play and ran the ball the length of the court and made a lay up while collecting a foul on Chris Paul. Australia had only 1 turnover in the first quarter, had 7 turnovers in the second, and only 3 turnovers in the entire second half. Think about that. Australia’s biggest let down was in the second quarter, when Coach K played a very quick, defense minded group consisting of Williams, Wade, Bryant, James and Bosh. In other words, when Coach K forced USA to play defense, Australia coughed up the ball like the other teams have. USA’s defense definitely slipped in this quarterfinals game from its previous performances, which troubles me. It should be getting better as games go on and mean more. But USA’s offense struggled to get going as well. When Kobe Bryant shot his first shot of the game, 3 minutes into it, USA was already 3 of 9 (33%). That’s a lot of quick and poor shots for 3 minutes. LeBron James started 0 of 3, Dwight Howard was 1 of 3, and Carmelo Anthony was 2 of 3. And although Bryant made that first shot, he missed is next 3 and was 1 of 4 for the first quarter. For the first quarter: LeBron was 1 of 5, Howard was 3 of 6, Anthony was 3 of 5, Kidd 1 of 1, Wade 0 of 2, and Paul and Williams were 0 of 1. And watching the game, it was clear the poor shooting was not due to Australia’s defense, but due to USA’s poor shot selection, particularly from the arc, which Australia’s defense was daring them to take. Defensively, Australia packed in their zone and dared the Americans to shoot from the outside (3 of 13 from the arc in the first half. And when USA did get the ball inside to Dwight Howard, they quickly hacked him; Howard had 5 free throw attempts in 14 minutes of play. And why not? Prior to this game Howard was shooting just 45% from the free throw line. – All 12 USA players scored. 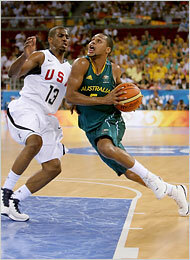 – Australia sent in a scrub named Worthington to hammer Carmelo Anthony. To Anthony’s credit, he smiled and walked away and left Howard and James to jaw with the scrub. – USA’s next opponent won’t likely be intimidated by the “Redeem Team, seeing as Argentina has 4 NBAers in its starting 5. – In the second quarter, Kobe rebounded the ball under the rim, and took such a severe fade away on his turn around jumper that he literally landed on his back on the 3 point line. I groaned that he attempted the shot, and laughed as it went in. Kobe is the best maker of bad shots I’ve seen. – The NBA should change its terminology for the playoffs from “first round, second round, etc.” to “quarter finals, semi-finals, conference finals, and finals.” The Olympics have figured it out: that repeated uses of the word “finals” leading to the NBA Finals would be stronger product branding. – Team USA had 13 offensive rebounds in the first half, which was allowing them additional shots and a shot at staying in the game. – Team USA was +29 in rebounding, astounding considering it was -4 in rebounds over the course of the first 4 games.